Michael Jackson's security guard testified Wednesday that he saw Dr. Conrad Murray trying to revive Jackson in a bedroom of a Holmby Hills mansion as the pop star's two older children were present. Faheem Muhammed, head of Jackson's security detail, took the stand Wednesday afternoon in Murray's involuntary manslaughter trial. He was among the first to arrive in the bedroom on the day Jackson died. He testified that when he saw Jackson, he appeared to be dead. "His eyes were open and his mouth was slightly opened," said Muhammed. Muhammed removed the children, Paris and Prince, from the room and returned to assist another guard. "Paris was on the ground, balled up, crying,'' Muhammed said. Prince "had a shocked look," he added. He returned to the second-floor bedroom and that's when Murray asked whether anyone knew CPR, Muhammed testified. He later accompanied the children and Jackson's personal assistant, who also testified Wednesday, to the hospital. They went to a private room as they waited for word about Jackson. Muhammed also testified that Murray asked him for a ride from the hospital after they learned of Jackson's death. The doctor made a similar request of Jackson's personal assistant at the hospital, according to testimony earlier Wednesday. Late in the day, the prosecution showed surveillance video of Murray leaving the lobby area of the UCLA emergency room after the bodyguards told him they would not take him back to the Jackson home. Michael Amir Williams, who began work as Jackson's assistant in mid-2007, was asked about a phone call he received from a "frantic" Murray as Jackson was dying in the bedroom. Williams was in downtown Los Angeles at the time, about 30 to 40 minutes from the Carolwood Drive mansion. "He said, 'Get here right away, Mr. Jackson had a bad reaction. Get somebody up here immediately,''' Williams said. Williams told a security guard, Alberto Alvarez, to go to Jackson's bedroom. "I told him, 'I don't know what's going on, but you have to go inside the house,'" said Williams. "I remember him walking, and I said, 'Are you there, yet.' He said, 'No.' I said, 'Well run, hurry.'" 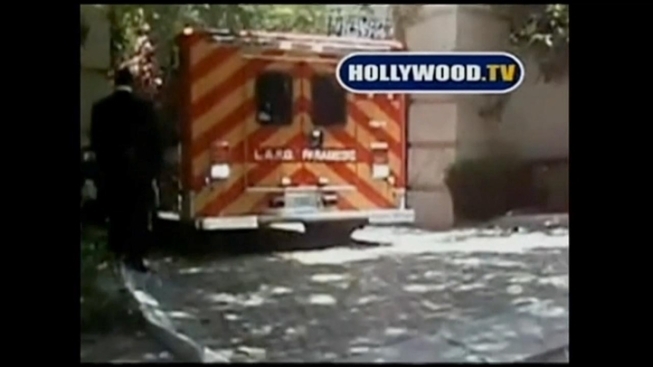 Williams later arrived at the mansion to see Jackson being loaded into an ambulance. The first thing he asked about was the location of Jackson's children, who were soon brought to a car that would follow the ambulance to the hospital, Williams said. "It was real frantic," Williams said. "I got there and saw the gurney coming down the stairs. I remember seeing (Murray) talking to medics." He was asked to describe Murray's physical condition. He then rode to the hospital with Jackson's three children -- Prince, Paris and Blanket -- and their nanny. Once he arrived at UCLA Medical Center, hospital staff took them to a private room. After learning that Jackson had been pronounced dead, he said Murray approached him in a hallway. "We were making small talk about how horrible this is, and he said, 'There's some cream in Michael's room that he wouldn't want the world to know about,'" said Williams. "He requested that I give him a ride back to the house so the world wouldn't know about the cream." Williams denied Murray's request and said he concocted a story about police taking his keys. It was the second day of emotional testimony in the case. Jackson sister LaToya Jackson tweeted during the lunch break, "It's so excruciating to relive the moments when Mike pasted (sic). It's even hard to pretend to be strong for my mother." Earlier Wednesday, an attorney for the company that promoted Michael Jackson's concerts testified that Murray asked for life-saving equipment just days before the King of Pop's death in June 2009. Attorney Kathy Jorrie said the doctor told her not to worry about the superstar's health. This was after Murray had asked for a CPR machine in case one wasn't available at the site of Jackson's upcoming comeback concerts, London's O2 arena, Jorrie said. "Dr. Murray told me Michael Jackson was perfectly healthy, in excellent condition,'' Jorrie said. The second day of testimony started with an executive with AEG Live who described the 50-year-old pop star as appearing strong and energetic two days before his death. Jackson appeared engaged and energetic at his final two rehearsals, AEG Live exec Paul Gongaware said. AEG Live promoted Jackson's "This Is It" comeback concerts. Gongaware and another concert executive were the first two prosecution witnesses called in the trial, which is expected to last about four to six weeks. Prosecutors wanted to show that Jackson and Murray were both engaged in preparations for the London concerts. Under cross-examination, Gongaware said the concert promotions company is being sued by Jackson's mother for negligent supervision of Murray when he worked with Jackson. Fans of Jackson and supporters of Murray gathered early Wednesday outside the downtown LA courthouse. Murray is accused of administering the anesthetic propofol, then failing to properly monitor Jackson before his June 2009 death. But defense attorneys argued Tuesday that Jackson caused his own death by self-administering drugs that created a "perfect storm" inside his body. During Tuesday's opening statements, prosecutors presented a recording of Jackson from Murray's phone on which a rambling Jackson can be heard talking about his upcoming concerts and his desire to amaze his fans. And, as Jackson's family watched, prosecutors showed an image of Jackson's body on a hospital gurney. The word "Homicide" was printed above the image. "We have to be phenomenal,'' Jackson, whose speech was slow and slurred, said on the recording that investigators retrieved from Murray's phone. "When people leave this show, when people leave my show, I want them to say, 'I've never seen nothing like this in my life. Go. Go. I've never seen nothing like this. Go. It's amazing. He's the greatest entertainer in the world.'" The prosecution was attempting to show that Murray should have realized there was something seriously wrong with Jackson. Deputy District Attorney David Walgren described Jackson as highly under the influence in the recording. "That is what Conrad Murray is seeing and observing," said Walgren. "What does he do? On May 12, he orders another shipment of propofol." In a tweet after Day 1 of the trial, Jackson's brother Jermaine said, "Today has been very distressing for all of us, and I'd like to thank you for your prayers at this horrible time. I would also like to remind some in the media that the voice recording of Michael does not show/prove he was 'an addict' -- and this leap to agree with the defense is unfair and inaccurate. The prosecution said my brother 'was under the influence of UNKNOWN agents' at the time of that recording by Murray." "I defended him throughout his criminal trial, and I never heard him speak that way," said attorney Thomas Mesereau Jr., who won Jackson's acquittal in his 2005 molestation case. Defense attorney Ed Chernoff also pointed out Jackson's drive to please his fans, but said it was that ambition that ultimately prompted him to give himself a fatal dose of medication. The defense claimed Jackson's doctor was trying to wean him off propofol. "Michael Jackson started begging,'' Chernoff said. "When Michael Jackson told Dr. Murray, 'I have to sleep. They will cancel my performance,' he meant it." Jackson's mother, Katherine, dabbed her eyes when prosecutors played video of her son rehearsing "Earth Song" at Staples Center in downtown LA. The prosecution's first witness, concert exec Kenny Ortega, testified that he was concerned about Jackson's health and thought he required serious help. "He was like a lost boy,'' Ortega wrote in an email to promoters five days before Jackson's death. "There may still be a chance he can rise to the occasion if we get him the help he needs." But Murray told him not to play amateur doctor or psychologist, Ortega told the jury.